Where to even begin. You can tell you haven't blogged in a while when you have to think really hard about what your account password is. We finished out August with our annual blueberry picking family camping trip. This year was the 30th anniversary of this extended family trip on Mike's mom's side. It is a looong drive from Medicine Hat, as you can see from the map below, especially as you have to drive between 30-60km/hr (more 30 than 60) for the last 100 km. 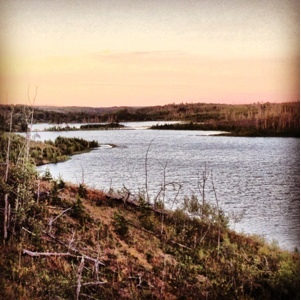 I dropped a pin at our campsite, which is up the Old Conklin Road North of Lac La Biche. Mike didn't bring any of his dirt bikes this year, he had to occupy himself with quading and fishing instead. The kids played non-stop with their cousins and were a level of dirty that cannot be quantified. They insisted to me that being dirty was an important part of camping for kids. I made them wash their feet every night before they went to bed though, as they were blackened and I just couldn't imagine them crawling into bed with feet that filthy. 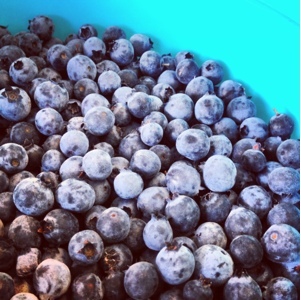 I picked 4 ice cream buckets of wild blueberries as well as 10+ cups of wild cranberries. The blueberries were cleaned and frozen for use in pies, muffins and smoothies, while the cranberries were canned into cranberry sauce. 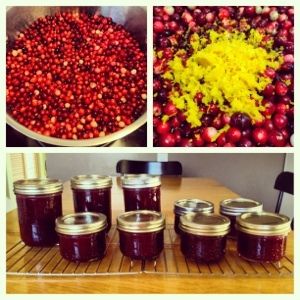 I made up a new recipe for the cranberries this year, I wanted to add some Christmas spice to them. As I've said before, wild berries are much smaller than anything you buy in the store, but the taste is incomparable. Tasting a wild blueberry straight off the bush is like tasting the colour blue. Simmer until completely broken down and dark red. Process as usual. You never know what kind of wildlife you'll see up North. 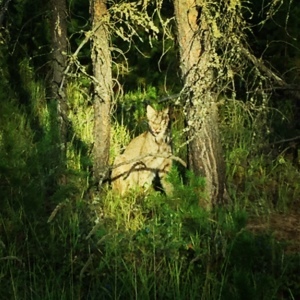 In addition to several chipmunks scampering across the road, we saw a black bear (which was larger than it looks, I took this picture from a distance), and not one, but THREE bobcats! 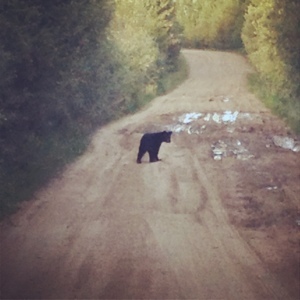 The first one we saw wasn't even scared of us, it sat by the side of the road staring at us while I took this picture. And no, they weren't the same bobcat being seen over and over again. We saw them separately over the span of 30km with considerable distance between them. One of them was much more orange than the other two we saw. Sorry for the poor quality, I took these with my phone. Here is a blurry picture of our campsite, and then the view facing the other direction. In the morning you could hear the haunting sound of the loons carrying across the water. Mike's cousin brought out a projector and we watched a couple of movies on the side of the quad trailer, including Mike's favourite movie, The Great Outdoors, starring John Candy. One night we had fireworks and another night we were graced with nature's fireworks; an enormous, gorgeous display of Northern Lights. I was tempted to wake up the kids to see them. All in all, it was a good trip. Everyone seemed to have a nice time, no major injuries occurred, and there was no damage to our vehicle, unlike last year (which was especially good as we had borrowed my parent's truck to pull our trailer). This was probably the last year that we will be going out to Steepbanks Lake though as the road has deteriorated to such a point that it is becoming impassable. We are on the look-out for a new camping spot which includes fishing, quading, blueberry picking, and a beach. If you know of any that meet that criteria, please let me know in the comments below.